QUITO, Ecuador (CNS) — Education is a right and a privilege that should impart not only knowledge and skills, but also a sense of responsibility for others and for the earth, Pope Francis told representatives of Ecuadorean schools and universities. 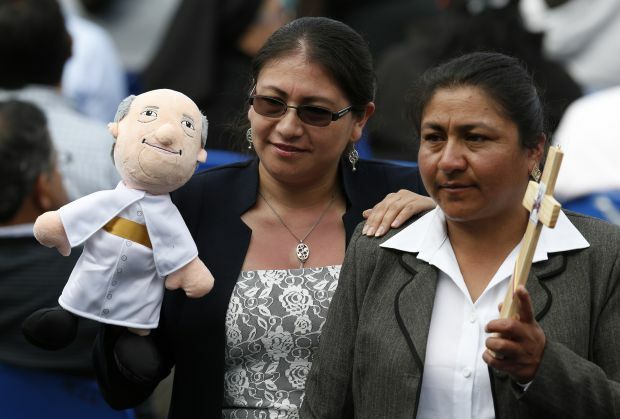 “God gives us not only life, he gives us the earth, he gives us all of creation,” the pope told an estimated 5,000 educators and students gathered for an outdoor meeting at the Pontifical Catholic University of Ecuador. God created man and woman for each other and gave them huge potential, the pope said July 7, but he also gave them — and gives each person — a mission to be part of his creative work. “I am giving you seeds, soil, water and sun,” the pope said God tells human beings. God gave people hands and gave them one another; he gave everything as a gift, the pope said. Quoting from and explaining some of the principles in his encyclical letter on the environment, “Laudato Si’,” the pope said God created the world and everything in it not “so he could see himself reflected in it,” but in order to share it. “Creation is a gift to be shared,” Pope Francis said. It is the place God gives humanity to exercise its creativity and to build a community of care and concern. The balance is delicate and caution is urgent “because of the harm we have inflicted (on the earth) by our irresponsible use and abuse of the goods with which God has endowed it,” the pope said, quoting his encyclical. “The earth herself, burdened and laid waste, is among the most abandoned and maltreated of our poor,” he said, still quoting. Selfishness, consumerism, a desire for money and power, a lack of respect for God’s design for all of creation — human beings included — have a negative impact on people and on the environment, he said. Pope Francis said people cannot ignore what is happening around them or pretend that it has no impact on them. Rather, he said, “it is urgent that we keep reflecting on and talking about our current situation” and take action. “I wonder if our answer continues to be ‘Am I my brother’s keeper? '” the pope said.